Podgora is a charming seaside settlement situated in a spectacular location on the slopes of the Biokovo Mountain that rises directly above the seashore. Biokovo is a protected nature park of immense natural beauty. This sight alone is an unforgettable experience for any visitor. 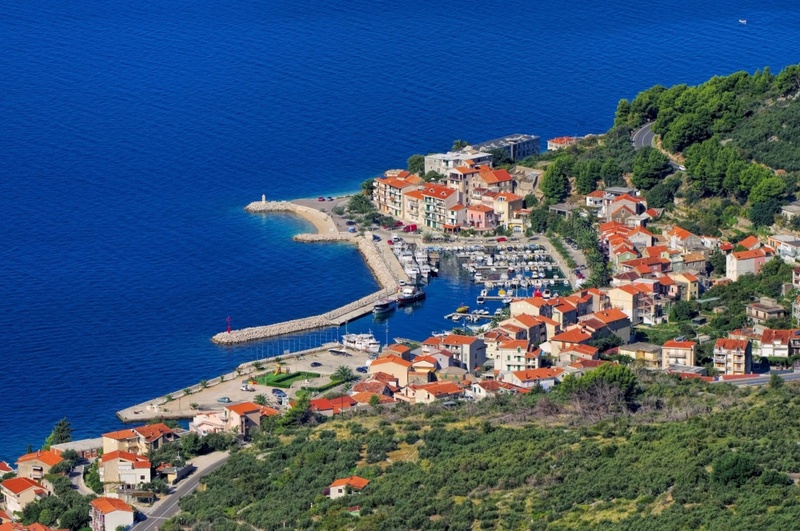 Podgora is a popular summer destination, but due to its mild climate, pleasant winter temperatures and the proximity of Biokovo mountain and nature park, it is an attractive getaway for winter tourism as well. It is 70 km south from Split and 160 km north from Dubrovnik; its position at the Adriatic Road makes Podgora well connected with the Dalmatian cities. Regardless of what direction you are coming from, once you arrive to Split or Dubrovnik, it is easy to reach Podgora by car or by bus. Since tourism is by far the most lucrative economy branch and Podgora has a century long touristic tradition, there are almost countless hotels and private accommodations to be found in the area, all in the immediate proximity to beaches. Some of the popular hotels include Minerva, Aurora and Mediteran. Podgora is a place with the purest sea; the tests have proven the highest ecological quality than anywhere else in the Adriatic Sea. The beaches are mostly pebbly or rocky, suitable for families with children, but also for romantic getaways. Thanks to a mild Mediterranean climate, the bathing season opens as early as May and closes at the middle of October. There are approximately 2700 sunshine hours a year in Podgora; with 46 days when temperature is above 30°C. Rain is a rare occurrence, and happens in the form of short lasting and refreshing summer showers. Apart from bathing and enjoying the heat of the summer sun, Podgora offers a variety of additional sport and recreation activities. You can rent a boat or a sea scooter, go paragliding or relax in the local spa center. And if you enjoy team sports, there are several tennis, football and basketball courts and also a pool. Podgora is among the safest harbors in Dalmatia; being shielded from the strong winds by Biokovo and with its well-indented bays. There are two marinas; Porat and Caklje, suitable to receive over 360 boats. Although Podgora is a small, peaceful settlement, it has a satisfactory nightlife offer. You must visit some of the local restaurants and enjoy the unforgettable aromas of simply prepared, fresh fish and seafood delicacies, accompanied by the glass of quality wine grown in the local vineyards. We warmly recommend Borak tavern and the restaurant Roko. In the city harbor there is a boat Labud where you can always purchase the freshly grilled fish delicacies. If you seek for some sweet refreshment after an appetizing meal, visit one of the local ice-cream parlors and patisseries. And if you are in the mood for a night out, head towards one of the local cocktail bars; Banana Bar, Shark and Azzuro; and dance the night away. Find information about selected Hotels, apartments and rooms in Podgora to choose the perfect place for your accommodation.